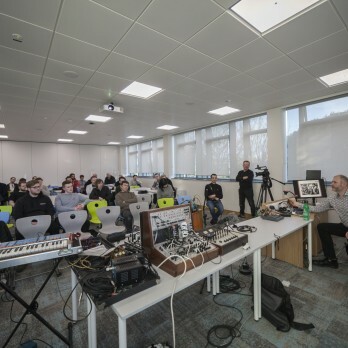 For over 10 years, we have created bespoke courses for DJs and music producers, event organisers and festivals, universities and schools, all throughout Northern / Southern Ireland. 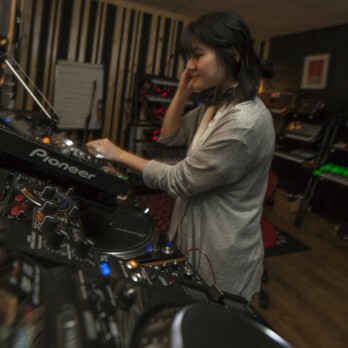 Our cutting edge training is designed to provide a resource for anyone connected or looking to be connected in the music industry. If you’re a complete beginner or an artist that would like a little help with moving forward, we have you covered. Our tutors are educated to degree level or above in the discipline they teach and are actively involved in the music industry. They are also fully vetted. 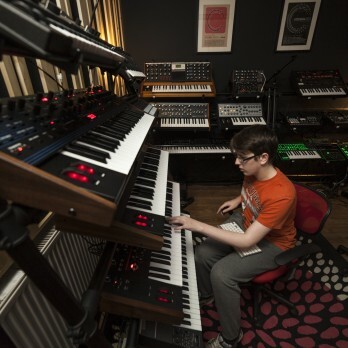 We take pride in providing a state of the art studio (just outside Derry City Centre), which is equipped with a fantastic collection of synthesisers, drum machines and outboard hardware, as well as an excellent selection of software DAWs, such as Ableton, Logic, Reason, Machine. We also have you covered for VST’s! All types of Djing is covered with a vast selection of professional turntables, CDJs, mixers and effects units. Over the past 10 years Movin Music Academy has worked alongside the University of Ulster, NWIFHE, Derry City Council, BBC Radio, Celtronic Music Festival, BBC Television, The Nerve Centre, plus various youth, community and special needs groups. We are always open to working with new partners, so if you have something that may be of interest, we’d love to hear from you!